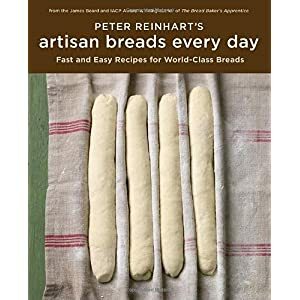 Many of us have just gotten our hands on copies of Peter Reinhart’s Artisan Breads Every Day and are furiously trying out Peter's new recipes. One well-tested recipe that he revived for this book is his Wild Rice and Onion Bread. I couldn't be happier about this because my memory is the same as Peter's: that after Struan Bread, Wild Rice & Onion Bread was Brother Juniper's most popular bread and is a bread I adore. It makes incredible rolls that are a perfect accompaniment to a Thanksgiving feast, so rediscovering this recipe now couldn't be more timely. Peter and his publisher have been kind enough to allow me to reprint the Wild Rice & Onion Bread recipe from Peter Reinhart’s Artisan Breads Every Day in full. Remove the dough from the refrigerator about 2 hours before you plan to bake. Shape the dough into one or more sandwich loaves (see page 23), using 28 ounces (794 g) of dough for 4 1/2 by 8-inch loaf pans and 36 ounces (1.02 kg) of dough for 5 by 9-inch pans; into freestanding loaves of any size, which you can shape as bâtards (see page 21), baguettes (see page 22), or boules (see page 20); or into rolls (see page 25), using 2 ounces (56.5 g) of dough per roll. When shaping, use only as much flour as necessary to keep the dough from sticking. For sandwich loaves, proof the dough in greased loaf pans. For freestanding loaves and rolls, line a sheet pan with parchment paper or a silicone mat and proof the dough on the pan. Mist the top of the dough with spray oil and cover loosely with plastic wrap. Let the dough rise at room temperature for 1 1/2 to 2 hours, until increased to about 1 1/2 times its original size. In loaf pans, the dough should dome at least 1 inch above the rim. If you’d like to make the rolls more shiny, whisk the egg white and water together, brush the tops of the rolls with the egg wash (see page 135) just before they’re ready to bake. Thanks for highlighting this bread Floyd. I have baked it twice in the last couple days and have learned a couple things about the process that may be helpful to others. I used the dry onions but forgot the note about having to add a couple additional Tablespoons of water to compensate. My first batch was a little dry and I didn't get the rise you show in your image. Next time I added the additional water and they rose fine and looked like yours. Second, I wasn't paying attention to the condition of the rice when I cooked it. The few grains that migrated to the surface were dried and very hard. The next time I used a 40% mix of brown rice and watched for the wild grains to butterfly as I simmered them and the results were much better. I usually make rice by adding the amount of water to the pan that will be absorbed during the cooking. A better way is to cook the rice in abundant water and drain it off later when done. A very aromatic loaf everyone loved. Thank you. Thanks for listing the weights for this one. Makes it much more "approachable" for me. ooh...also pan sizes, and dough weights for each. Even better. Adding wild/brown rice to the shopping list for my next trip to store. Is this something picky-eater kids would like or am I better off sticking to white bread rolls for Thanksgiving? Inspired to have a go at the wild rice and onion my opportunity came last night after work when the duty chef was interested in doing something a little different so we collaberated. i maintain a sour dough started at the college so decided while i was giving it its morning feed to use some of that in my preferment so used 2kgs of wholemeal flour and 1/2 kilo of bakers flour and 2.5litres of warm water. this was set aside in a bucket to start work. On completion of my normal PAID duties i went to the bakery and after helping the student chef with the evenings dinner rolls we then turned our attention to the special dough. The preferment had moved along very well, better than i had expected so was a tribute to the sour i had attended for the last 6 months. the rest of the dough consisted of bakers flour 2.5kgs, salt 100g, butter 100g, black strap molases 100g, cooked black glutenous rice 500g; diced fresh brown onion 1kg.gluten powder 100g. i decided to add 50g dried yeast representing 1% so that we would have a result based on the known activity of that yeast. it was allowed to bulk ferment in a stainless steel drum for about 1.5 hours and was taken at its peak. The dough was handed up and allowed to recover ther were 18 x 500g pieces and 8x200g pieces. Wild rice and onion sound like a fabulour combination. You breads look wonderful. I am sure they will make great open sandwiches. I have dried spring onions at home. I will have to give this recipe a try! A days late and a dollar short..this would make awesome stuffing! if you had any left over..haha! This is the first time I have made bread, from scratch and NOT used my bread maker.... I am impressed with the flavor and texture of this bread ! Thankyou for sharing this recipe.... I am making more to give family for Christmas. I baked this bread Christmas Eve afternoon and we had it with dinner that night. It was a big hit and I thank you, Floyd, for posting the recipe here, and Peter Reinhart for allowing you to do so. I've been baking sourdough for the past year and it was nice to try something new. It sure is a wonderful flavor, Betty. I made two more loaves yesterday for my neighbors and have another patch in the cooler to be baked tonight. The cost of pure wild rice is out of sight, so I've substituted with Lundberg Wild Blend, which is labeled as "a gourmet blend of wild and whole grain brown rice." $3.39 for a pound. I didn't really taste the wild rice in the first two loaves, so I think this new blend should work. Yeah, wild rice is. Lundberg's Wild Blend is exceptionally tasty and has good tooth. There is something about the chew to wild rice, which I think adds a bonus to this recipe. Don't you think, if ever you had some left over, that this would make great stuffing? Although I don't see that happening! I just pulled two loaves of Wild Rice & Onion Bread out of the oven to go with a pot of split pea soup I made this evening. The smell of this bread drives me crazy... I can't wait to eat it! 1st attempt at rice/onion bread -- is kneading really necessary? 5 minutes with the dough hook is comparable to an 8-10 minute hand knead, so either should be fine. I made it this weekend and did about 5 minutes with the machine (dough hook) and it came out lovely. I'll be making this one again. Floyd, thank you for the answer on using the machine versus hand-kneading. I did just that and had excellent results -- rave reviews from our guests and the kids! I also substituted leeks for the onions, and the flavor was great. Lastly, though I would not do this again on purpose, I forgot the instructions called for making this dough the night before -- I had already invited the company and set the menu for tonight. I mixed the dough around 1 p.m., refrigerated it for a few hours, and shaped and proofed it around 4 p.m. Still had great oven spring, though the crumb was fairly dense. I'd love to use caramelized onions instead of chopped. I just love the flavor. Do you think this would work in the bread? Finally got around to making this dough. WOW is all I can say. The flavor is incredible and I just used brown rice because it is what I had. Have to look for wild rice is the store. I think next time I will do the optional egg wash just to get a nicer looking crust. Mine is not quite brown enough. I made rolls this time and I was worried about overbaking them to get a browner crust. Next time I think I will make some larger loaves. I like the idea of carmelized onions too. Many thanks for the recipie, now I must get the book. I actually used natural yogurt instead of buttermilk, but the flavour was superb. Makes two good loaves, I have one in the freezer, we will see how it keeps. Wild Rice - Calling To All Creative Heads Out There! I hsve the book, and am loving the recipes to bits. Been meaning to try this one, except that I don't think we have wild rice available locally. Anyone has a good idea for a substitution? Any creativity is welcome! Or how about rice boiled in green tea? Interesting idea! I was researching yesterday night, and was keen to try a mixture of whole grains (buckwheat, millet and quinoa). Just realised PR's book offered some alternatives as well. Will probably replace the white onion with red for maximum colour effect! :D This will be counter with green chives and spring onions. What d'you think? Great topic Floyd, thanks for posting it! I ordered ABED and BBA both from Amazon today, and they will be here next Monday, I'm really excited as it's a natural next step forward from ABI5, which I have been using for some months now. I am finally getting some pretty good results from ABI5, but Peters books sound a little more exciting. I can't wait to try this recipe out, thanks everyone for your pointers and tips. I made this today, but when I got the rolls and the loaf out of the oven, they were flat. Not completely flat, but they were definitly misshappen. After the first ferment, I shaped rolls and a loaf (a batard) and when proofed, they were not standing up. I feel as if I had too wet a dough, could that cause the lack of rise? They taste fine and the crumb is pretty good, but they just don't look like the pictures posted here. Considering that the temps here in Minneapolis have fallen, and the house was pretty cool, it may also be that the rise was retarded by the temperature of the kitchen. In the case that the house was too cold, would a longer rise time help or is it better to put them in a warmer place to proof? Thanks for the recipe. Those are some beautiful loaves, Floyd. I have a batch of dough fermenting in the fridge right now. I either got lucky or the recipe is foolproff. I'll be making this again very soon! I made this bread for thanksgiving and it was spectacular. It was so good in fact that I am making gift baskets of a loaf of this and a loaf of my SF Sourdough for the hollidays. Is there anything special, other than monitoring my percentages, that I should be aware of when doubling my recipe? Any insight would be a big help. I don't think so. The only thing I can think of is to keep an eye on your mixer, if you use one... you don't want to strip the gears by trying to mix too large a batch. Im not worried about that since I do all my mixing and neading by hand. I burned out the gears on my KA pro 6 last year making bagles. Hopefully I will be getting a 10 quart hobart or globe for Christmass which will put my baking back on the fast track. thanks for posting this recipe When I steam my rice tonight for dinner I will add the carmelized onions, the herbs & spices, but will probably need more for the bread so maybe I'll do an herb/spice soaker too. I bet some poppy seeds on the top would be lovely, too. I chose to make this recipe during a freak cold front in Thailand, temps down from high 90's to high 50's-and having made all my breads in relatively warm weather I wasn't prepared for what happened...nothing...I waited and waited for my bread to rise, but it never did! I finally baked it b/c I was concerned about too much enzymatic activity turning the dough to mush (does the cool weather affect the enzymatic activity too?) I got a bread brick, with mush in the middle! :) I fed it to my dogs, and when they got tired of it I left the rest for the birds. Ah well, it smelled so delicious in the oven, I'll try it again on a hot day. this will DEFINITELY be one of our favorites. Unbelievable taste. Will make it into rolls for Thanksgiving. Thank you Peter Reinhart and Floyd ! I remove the rice from the outside of the dough-fillings are too expesive! I made this in rolls for Thanksgiving. They were a big hit, even with my 'picky' son, who usually doesn't like anything in his bread. I made them in my wood-fired oven. The rolls took about 12 minutes for an internal temp of 190 degrees. The crust was golden. This is definitely a recipe I'll use again. TFL to the rescue again. We have a lot of onions from our CSA and Thanksgiving is coming up. This seems like the perfect recipe! this amazing recipe prompted me to purchase BBA.